In this Immersion Lab, participants will learn the basic operating principals of the femtosecond frequency comb along with its applications. The development of the fs frequency and related technology has given rise to the field of attosecond science and enabled the rapid development of atomic clocks based on optical transition frequencies. A frequency comb consists of a mode-locked pulse train where the phase of each pulse is known and controlled. This enables the optical frequencies of the mode-locked laser to be precisely determined by measuring the laser repetition rate and the “carrier-envelope offset frequency”. In the time domain, this enables the generation of short optical pulses where the carrier phase can be utilized for studying dynamics that occur at a fraction of an optical cycle (ie on attosecond time scales). Likewise, the spectrum then consists of a “comb” of equally spaced frequencies, similar to having thousands of narrow linewidth cw lasers. The absolute value of each comb “tooth” can be easily determined by measuring the pulse train repetition rate and the carrier-envelope offset frequency. Schematic of the Er fiber laser and apparatus to detect the carrier-envelope offset frequency. Participants will use a mode-locked erbium fiber laser to explore the time and frequency domain properties of a frequency comb. A key requirement in utilizing the pulse train from a mode-locked laser as a frequency comb is the detection of the so called “carrier-envelope offset frequency”. This frequency is simply the changing phase, from pulse to pulse, between the electric field (carrier frequency) and the pulse envelope. To detect this time varying phase of the pulse train, participants will build an “f to 2f” interferometer. In doing so, they will be introduced to 1) fiber laser amplifiers, 2) super-continuum generation in fibers, and 3) second harmonic generation in nonlinear crystals. In addition, and with time permitting, participants will be introduced to simplified electronic circuits for actively stabilizing the carrier-envelope offset frequency to a stable RF reference. The femtosecond frequency comb is now a critical component of any optically-based atomic clock because of its ability to link the optical frequency of a cw laser (100’s THz) to that of its easily measureable repetition rate (∼100 MHz). This lab will provide the basic understanding to develop a simplified Er fiber laser-based frequency comb and to demonstrate its use in precision spectroscopy. 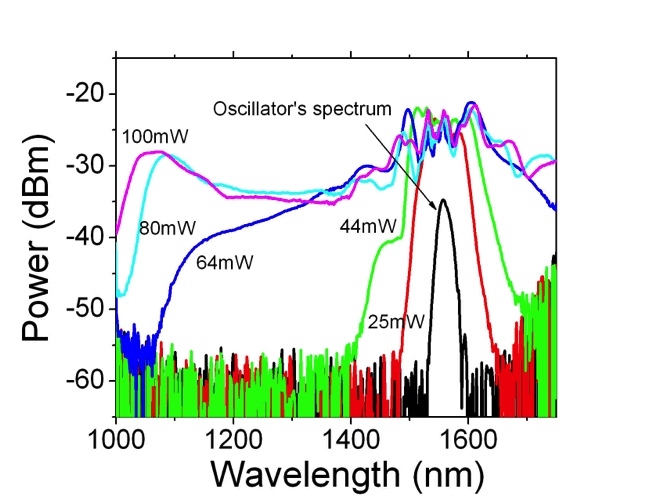 Super-continuum spectrum generated in the nonlinear fiber at various incident power levels. On the first day participants will be given an overview of the Er fiber laser and its basic operation. Then, they will set up an optical amplifier based on Er fiber. Such amplifiers are a key component in fiber based communication technologies. They will calculate the expected gain, characterize the amplified pulses with an auto-correlator, and learn how to maximize the peak power after the amplifier to enable super-continuum generation in a small section of nonlinear fiber. An interferometer in which one arm is frequency doubled using a nonlinear crystal (the f-2f interferometer) will be used to detect the carrier-envelope offset frequency of the pulse train. On the second day, participants will learn how to electronically lock the carrier-envelope offset frequency to a stable RF reference. They will then learn how to use the frequency comb to directly measure the absolute optical frequency of a cw laser. Participants will learn basic optical alignment, fiber handling techniques, simple electronic control and designs for phase-locked loops, and the underlying principals behind the fs frequency comb. Participants are encouraged to bring a notebook. The laser wavelength is considered eye safe. However, protective laser safety glasses at 980nm (pump) and 1550 nm will be provided. The equipment cost is estimated at $15k, not including the Er fiber laser. Major costs include the current controller and pump laser for the Er fiber amplifier, nonlinear crystal for second harmonic generation, and an avalanche photodiode and other detection and control electronics.